Our pets are an important member of our family, and we would do anything to help them. As they age, or perhaps in the event they suffer an injury, special medical attention may be required. Hip dysplasia, ligament injury, and arthritis are a few of conditions that could affect your dog's mobility. These condition can come on suddenly or be a slow progression. Your once active energetic dog may now be resigned to a day of just laying about, possibly in pain. Fortunately, there are options to help your pet regain mobility and a happy, active life once again. They include joint support supplements and mobility aids. This kit includes three proven supplements that synergistically work together to reduce inflammation and increase mobility. Products can be purchased together at a discounted package price or individually as shown below. Amazing Arthrosoothe- Comprehensive support for pets with hip and elbow dysplasia, arthritis, injuries and slowing down due to old age. Helps to repair and rebuild joint tissue and cartilage. Curcumin for Dogs and Cats- Research on the antioxidant and anti-inflammatory benefits of curcumin continue to emerge. Curcumin is an amazing supplement that fights cancer, improves mobility quickly and offers lasting results. Amazing Omegas - The most comprehensive, pure and effective fish oil for pets. Packed in glass bottles to prevent leakage of toxins from plastic into the oil. Reduces inflammation and cartilage break-down. Pets show improvement in arthritis symptoms and develop a gorgeous coat. Harnesses and slings-mobility devices that are for dogs that have trouble standing or that get tired easily, but have not lost all their mobility. Ramps- for dog's that have trouble climbing stairs, simply setting up a ramp will allow your dog to easily walk up. Boots and Splints- If your pet has partially mobility, but is unsure of their footing or needs added joint support (perhaps from being injured) using a splint or boot could help significantly. Dog Wheelchairs- For those dogs that have lost much of their mobility, a dog wheelchair--or a dog cart, as they are sometimes called. For dogs with degenerative disc disorder, the devices can help take the weight off the dogs' damaged parts. 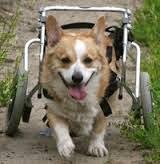 Dog wheelchairs allow pets to run, play, and even swim again getting the exercise they need. to live happy, healthy lives. Maintaining or regaining your dog's mobility is important to both you and your dog. Just as a cane or wheelchair can help humans overcome their challenges, using the supplements and mobility aids can help your pet have the active lifestyle that they crave and to live a happy, healthy life.